One wouldn’t think a book about growing up behind the Iron Curtain under the thumb of the Soviet Army and an oppressive Czechoslovakian government that squashes any form of free thought or expression would make this website. And you’d be right. Usually. The Wall by Peter Sis is an exception. It’s part picture book. The majority of the book is black and white. At first the only other color used is red, and only to illustrate the communist influence – stars, flags, banners, bandanas, missiles. Eventually, as news and ideas from the West creep into Czechoslovakia, so do colors into the book. American and British flags. Musicians. Sports figures. Artists. Yellow submarines. And as more ideas are expressed, the more the government attempts to squash them, returning the book to black and white and red, with only the occasional color, like subversive Western thought, sneaking in. The pictures, at first seemingly simplistic, offer more detail, often amazing and tiny details, with each reread. It’s part history lesson. As Peter’s story is told across the bottom of the page, italicized writing in the margins tells the history of Czechoslovakia as Peter grows. Readers learn how the Soviets took control of the country and closed the borders, how communist ideals were demanded and enforced, and how children were brainwashed into believing this was the only acceptable way of life. Readers learn how people behind the Iron Curtain learned more about Western styles (long hair, blue jeans) and music (the Beatles, Beach Boys, and Rolling Stones) and culture (theater, poetry, and even the Harlem Globetrotters) and how the government tried to stop it all. And it’s part memoir. A one-page introduction explains the formation of the Eastern Bloc countries after World War II. At the end is an explanation of what happened to Peter’s family during these years. Interspersed between are three two-page spreads of excerpts from his journals which include school lessons, sports memories, arrests, rock bands, censorship, and the beginnings of his art career. The earliest journal entry is dated 1954 and the last is dated June 1977. Also included are photographs, posters, historical documents, and additional drawings showing even more of the time period. I just noticed another amazing detail. At the top left of each journal page is a picture of a brain. The first brain is all red – the young boy who knows only what he’s taught. The second brain has many colors – the young adult now exposed to new ideas and beginning to think for himself. 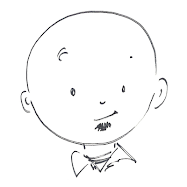 The last brain is fully developed – the adult who now knows the freedom he desires, long forbidden. 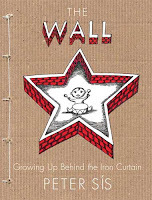 No, a book about growing up behind the Iron Curtain would normally not be a one I’d recommend. But The Wall, through its many layers and incredible pictures, is a remarkable book and deserves recognition. This is a marvelous picture book, but hardly for grades below 6. Students need to have a background or understanding of the Cold War, communism and some fairly high-end vocabulary. I'm using it in the 8th grade! You're right, the vocabulary is advanced and background knowledge of the Cold War and communism would be neeeded to understand the book. When I originally wrote the review, however, I had a teacher and students in mind. That wasn't clear in my review. This book would be a great way to give students that background knowledge to use with future texts that delve much more deeply into those topics. Communism and the Cold War are tough. The Wall shows their seriousness, but stays at a level that's not threatening to younger students, especially with a teacher's guidance. I use it with my fifth graders every year as part of our unit on the Cold War. I think with the proper pre-reading activities, it can be valuable, as you said.